Biogas has been promoted as a renewable, cleaner and cheaper energy source.While there are several initiatives promoting the use of biogas, credible analyses of its effects on the use of alternative energy sources and energy related expenditure are limited. 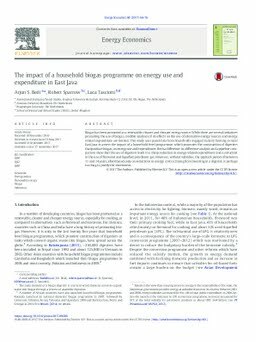 This study uses panel data from households engaged in dairy farming in rural East Java to assess the impact of a household level programme, which promotes the construction of digesters that produce biogas, on energy use and expenditures. Both a difference-in-difference analysis and a pipeline comparison show that the use of digesters leads to a sharp reduction in energy related expenditures and a reduction in the use of firewood and liquefied petroleum gas. However, without subsidies, the payback period of between 11 and 14 years, albeit based only on reductions in energy costs accruing frominvesting in a digester, is perhaps too long to justify the investment.